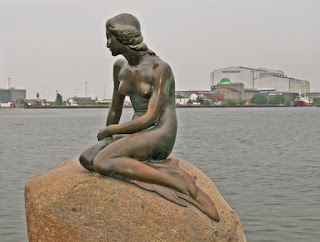 Today I'm going to tell you about my favorite fairy tale, "The Little Mermaid" by Hans Christian Andersen. The history of this princess tale is quite different from Snow White and Cinderella. Instead of being passed down verbally for generations before getting transcribed, "The Little Mermaid" was an original story that Hans wrote about unrequited love based on his own tragic experiences with romance. It was inspired by the story of Undine by Baron Fouqué, about a mythological water nymph who must marry a human to obtain a soul, but will die if the human is unfaithful. Though "The Little Mermaid" had fewer direct adaptations than Snow White or Cinderella, it inspired many films and TV shows about mermaids who either fell in love with humans or had the ability to transform into a human. In Denmark sits the statue of the mermaid herself, permanently caught between two forms and two worlds. The most famous version of this story is Disney's The Little Mermaid, which was released in 1989. There are people who believe that Disney invented the story themselves. That might be for the best, since the original story of "The Little Mermaid" is quite dark. In it, the mermaid agreed to have her tongue ripped out by the sea witch in exchange for legs that felt like walking on broken glass. When she failed to win the prince's heart, she was offered a knife to kill him with so that she could return to the sea with her sisters and save herself from certain death. The mermaid turned down the offer and selflessly cast her human body into the sea, where she expected to dissolve into sea foam. Instead, she transformed into a spirit, known as a Daughter of the Air, and had the opportunity to gain an immortal soul in 300 years, which was her initial goal in marrying the prince. There are no adaptations I am aware of that expand upon what it means to be a Daughter of the Air or what happened to the little mermaid for those 300 years, so I wrote my own, entitled Of Land and Sea. The first half of the book details the life of the woman who married the prince. I wanted to know more about who she was and how her life became entangled with the mermaid's. The Disney version simplified her character by turning her into the sea witch in disguise and naming her Vanessa. In Hans Christian Andersen's story, however, she was unaware of the role she played. The princess from the temple had no idea what the mermaid had sacrificed to be with the prince or that she was taking all of that away. I made her a passive character in my story because I believe that she was merely a victim of circumstance. The second half of the novella follows the mermaid as a Daughter of the Air on her quest to gain an immortal soul. Of Land and Sea: The Untold Story of The Little Mermaid is available on Amazon in both paperback and Kindle formats. Before Disney's adaptation, there was an anime movie of The Little Mermaid in 1976 that followed the original story more closely, but had the mermaid turn to sea foam at the end instead of joining the Daughters of the Air, making it even more tragic. Interestingly, Walt Disney was going to do an adaption of the story in the 1940s when he was still alive, but the project fell through. We'll never know how close his version would have been to the original tale. It's a good thing it got revived again in the '80s because it is famously known as the movie that started the Disney Renaissance. The magic of Alan Menken and Howard Ashman's songwriting, Glen Keane's artwork, Jodi Benson's beautiful voice, and Hans Christian Andersen's heartfelt story created a truly breathtaking film that will continue to be enjoyed for generations to come. The story also inspired not one, but two animated series in the early '90s. There was the Disney series, based on the film, and the Saban series, which had a terrific pilot episode, but went downhill from there. The Disney series shows what Ariel's life was like before met Eric. She was always an outcast among the other merfolk and swam around helping anyone who didn't fit in, which makes her character easy to relate to. It also featured some great songs and decent animation for the time. Saban's Adventures of The Little Mermaid started with Hans Christian Andersen's tale but introduced a friendly sorcerer character as a foil to the sea witch. He saved the mermaid, Marina, from certain death and provided her and the prince with two potions. One could turn her human for an hour each day and the other allowed the prince to breathe underwater for an hour each day. It was a clever way to give the story a happier ending. Unfortunately, they didn't know where to take the series from there, so the rest of it isn't as satisfying. Due to the difficulty of filming and talking underwater, there have been few successful live-action adaptations of "The Little Mermaid." There were attempts, but the idea has become far more popular since Hannah Fraser began the trend of "mermaiding" over a decade ago. For those of you who are unfamiliar with it, "mermaiding" means putting on a form-fitting mermaid tail over a mono-fin and swimming in the water with it like a mermaid. Many people were inspired to do this because of The Little Mermaid. It became even more mainstream in 2006 with the Australian live-action series H2O: Just Add Water and its spin-off, Mako Mermaids, which both filmed scenes underwater and feature girls who have the ability to transform from humans into mermaids when they get wet. The 1984 feature film, Splash, invoked a similar premise. In fact, Madison's iconic blonde hair is part of the reason that Disney decided to make Ariel a redhead instead of a blonde. One thing every mermaid fan should be aware of is the amazing mermaid phenomenon from the Philippines known as Dyesebel. It began 1952 as a comic book version of "The Little Mermaid" with a few distinct differences. Dyesebel's mother had a tragic romance with a human, resulting in the little mermaid princess being born on land. She was placed in the care of her mother's best friend and raised in the sea kingdom of Sirenea. History was doomed to repeat itself when Dyesebel grew up to fall in love with a human named Fredo. She made a deal with a sea witch to become human so she could be with Fredo and suffered endless torment from his jealous ex-girlfriend, Betty. There have been may film and television adaptations of this story in the Philippines, but the best one is probably the 2008 telenovella, which is currently available on YouTube with English subtitles. One of the many subplots in the series is that Dyesebel is the secret princess of Sirenea, which was usurped by a wicked queen, making it a perfectly princess drama. Before "The Little Mermaid," stories about mermaids were a mixture of siren mythology and unconfirmed manatee sightings. They were wicked seductresses that lured sailors to their death. Today, thanks largely to Hans Christian Andersen's tragic tale, they are portrayed as passionate, selfless, loving creatures. With not one, not two, but three potential live-action Little Mermaid movies on the horizon, the most famous mermaid princess of all is very much alive in our hearts. Whether her sacrifice to find love will pay off remains to be seen. The Little Mermaid is one of my favorite fairytales too. Such a beautiful story. The tragic love she has is always such an emotional connection that helps us to relate to her.